Edwina Bartholomew on Channel 7’s Sunrise. EDWINA Bartholomew has apologised to the ABC's Four Corners show for an "unacceptable" mistake on Sunrise yesterday. The Channel 7 breakfast show was yesterday accused of "theft" after it used footage from the Four Corners special about the Thailand cave rescue but failed to credit the ABC and covered up the broadcaster's watermark. The ABC reporter responsible for the Four Corners "Out Of The Dark" special vented his frustration on Twitter yesterday. "Channel 7 has ripped off all of our @4corners interviews … no attribution … and no shame," Mark Willacy wrote. Fellow ABC news presenter Juanita Phillips responded to Willacy's tweet and wrote: "It seems to be becoming accepted practice. They should be ashamed." 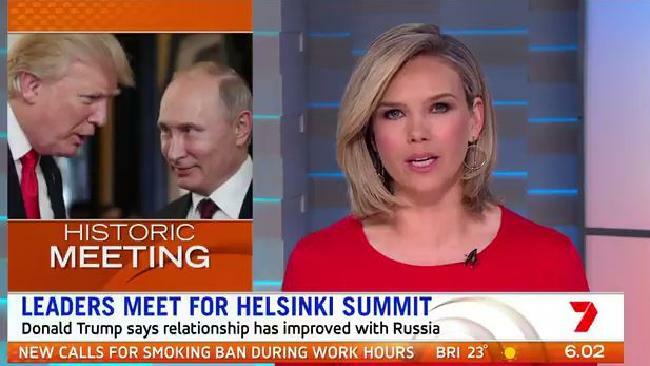 But the lack of attribution was simply a mistake according to Sunrise executive producer Michael Pell. "It's not acceptable," Pell wrote on Twitter. "It was an error." Four Corners researcher Lucy Carter tweeted: "It was theft. Plain and simple." Pell denied that was the case. "Theft is intentional. This was not. It was corrected this morning. We move on," he wrote. Pell added that the ABC watermark was accidentally covered up due to "a busy screen of supers". Once Sunrise realised the mistake on air yesterday it made sure the ABC was credited in the remaining crosses. "I have apologised for the error," Pell said on Twitter. "We also did attribute dozens of times throughout the show this morning." Sunrise presenter Edwina Bartholomew apologised to Four Corners this morning, tweeting: "Our use of @4corners #ThaiCave special without attribution was unacceptable. I raised concerns yesterday morning that there was no watermark on screen. This mistake was fixed but it is still not good enough. @markwillacy and @lucethoughts did extraordinary work. My apologies."